Boy names ending with o have become quite stylish in recent years. There’s Leo and Theo, Arlo and Milo, Mateo and Diego and Santiago. I’ve written about tons and tons of names in this category before, but I keep discovering rare boy names ending in o that have been overlooked. 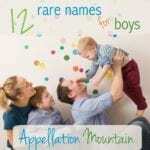 If you love this style, but want something truly unusual, these ten boy names might be for you. Brio means spirit, from an Italian word that might trace its roots to the Latin ebrius – drunk. In music, to play con brio indicates that musicians should play in a lively fashion. We’ve been naming our boys Brian, Bryce, Brandon, Brendan, Brayden, and so on for ages. Now Briar shows signs of rising. Brio, however, remains neglected. It’s never been given to even five children in a single year in the US. 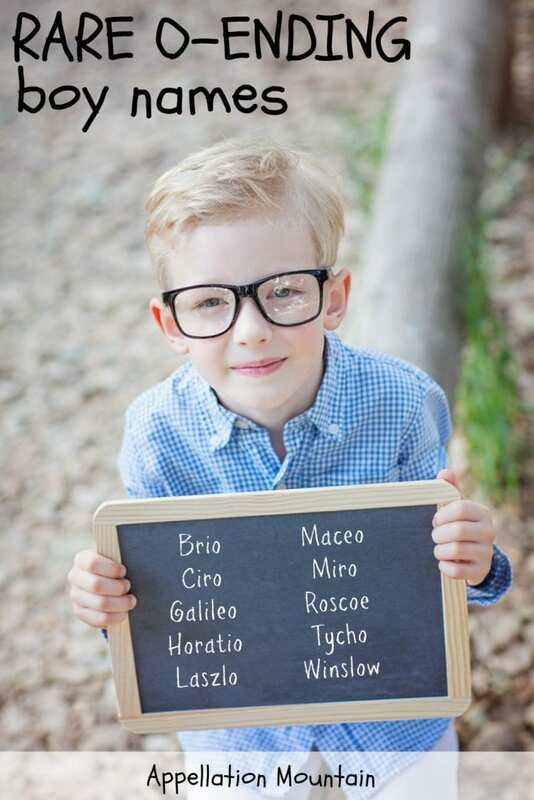 If you love boy names ending with o, appreciate a great meaning, and want something that stands out and fits in, Brio belongs on your list. Ciro appears in Spanish and Italian as a form of Cyrus. One downside? It rhymes with zero. But there’s plenty of upside here, too. Ciro feels every bit as romantic as fellow Italian picks like Luca, Mateo, and Giovanni. In fact, it counts as a Top 100 staple in Italy, but has never cracked the US Top 1000 in the US. The Italians pronounce the c with a ‘ch’ sound: CHEE roh. Americans would probably read this as an ‘s’ sound instead. If you’re crushed that so many romance language favorites have caught on, Ciro remains an under-the-radar possibility. We love celestial, night sky names like Stella and Luna for girls. On the boys’ side, Orion has fared well. So why not Galileo? It means from Galilee, but refers most often to a leader of the seventeenth century scientific revolution, Galileo Galilee. The Italian mathematician, astronomer, and physicist made dozens of discoveries, and ultimately found himself at odds with the church over one of his most famous findings. The Earth revolved around the Sun – a position described as heresy in the 1600s. While the name remains rare, thirty boys were named Galileo in 2015 – a new high. The possibility of nickname Leo makes this even more wearable. There’s something jaunty about Horatio. It just sounds big and bold. Or maybe that’s the character of Horatio Hornblower, combined with all of those Horatio Alger novels. The name comes from Horace, via the Latin form Horatius. But while Horace feels staid and dignified, maybe even dour, Horatio seems exuberant. It’s also teetering on the edge of extinction. After a brief boost from a Hornblower television adaptation and a popular CSI: Miami character earlier in the century, it’s slid again to near-obscurity. The Slavic name Vladislav consists of two elements, meaning rule and glory. That makes for a big name, and one rarely heard in English. Ladislas serves as the Latinized form; and Laszlo, the the Hungarian. While Laszlo comes with a non-intuitive spelling, it might make for the most approachable form of the name, thanks to that ‘o’ ending. We’ve seen characters named Laszlo in Casablanca and The English Patient. We’ve also seen quite a few alternate spellings. Musician Pete Wentz named his younger son Saint Lazslo. (No word on why he reversed the z and s.) And Lazlo appears sparingly, too. Maceo probably started out as an obscure form of Matthew. It remains in sparing use for a few reasons: a nineteenth century Cuban freedom fighter, a composer from the Harlem Renaissance, and funk and jazz saxophonist Mateo Parker. It makes headlines now thanks to Halle Berry’s son with Olivier Martinez, Maceo Robert. Even if the name’s origins are obscure, the sound is pitch perfect. Take Top Ten favorite Mason, mix in a healthy dose of Top 100 Mateo and this name serves as a great alternative to so many popular o-enders. The Slavic element miru means peace. Think of Mir, the Russian space station. Slavic boy name Miroslav combines peace with glory. It traces back to at least the tenth century. Just Miro claims a much briefer history. Mirko served as the common nickname. But Miro brings to mind the Slavic name, as well as notable twentieth century Spanish sculpture, Joan Miro. It remains used in Slavic languages, as well as Finnish. It also brings to mind mirus – the Latin root of our word miracle. Miranda and Mirabelle trace their origins to the word, so why not the more masculine Miro? Combined, Miro makes for a rare boys’ name with a globe-trotting pedigree and several appealing associations. Lately, I’m all about Roscoe. Here’s the challenge: it reads a little hick, thanks to a bumbling fictional character from The Dukes of Hazzard. But Hazzard baby names make for a surprisingly stylish bunch. Lulu, Milo, or Daisy, anyone? And so Roscoe deserves a fresh look, too – especially with the franchise fading into the past. Roscoe started out a surname derived from a place name, Old Norse by way of Lancashire, England. It means something like “doe wood” – woodland with plenty of deer. Today, it feels ready for revival. It faded throughout the twentieth century, disappearing by the 1970s. If you love Arlo, but feel like it’s catching on too fast, Roscoe makes a reasonable substitute. I recently wrote about Tycho. Combining a great meaning and a world-changing namesake, plus a long history of sparing use, Tycho makes for an unexpected, but very wearable, choice. Parents have embraced plenty of Ty names over the generations: Tyrone, Tyler, Tyson. 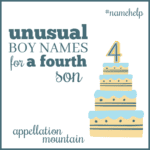 It feels like a logical, go-to name for a boy. Harlow and Marlowe trend towards the girls, while Winslow remains unclaimed. 45 children were given the name in 2015, split almost evenly between boys and girls. Winslow comes from an Old English place name. Artist Winslow Homer makes it famous – and creative. The Eagles immortalized the town of Winslow, Arizona in their 1972 hit song, “Take It Easy.” If you visit the town today, you can see a statue in Standin’ on the Corner Park. The name feels a little sparkier that buttoned-up Winston, but more conventional than many of the choices on this list. Given our affection for W surname names, it seems surprising that we don’t hear Winslow more often. 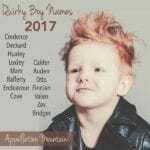 Would you consider any of these boy names ending with o? Can’t get enough of this style? There’s an even longer list here. We have heavily considered Roscoe for our babies. I had an oncologist for many yers with the name, so I picture a bow-tie wearing friendly grandpa when I hear it. 🙂 Utimately, we haven’t used it because I fear people would shorten it to Ross. I do like Laszlo also! I have a son named Roscoe. The people who mention Roscoe P Coletrain to us are at least 50. Otherwise I would say we get positive feedback on his name. We do tend toward “hickster” names though. Siblings- Clyde and Frannie. This just mustn’t be my style … I couldn’t get excited by any of them, until I came to Horatio. Now there’s a name! Just seemed to have a bit more substance than the rest. I’m surprised you didn’t mention Bosco! So am I! What was I thinking?! I love Laszlo, Galileo and Roscoe from this list. Some of my other favourites are Crusoe, Oslo, Finnbo, Cassio, Falco, Leandro, Russo, Viggo, Amadeo, Jericho, Calvino, Yoshio, Ingo, Cicero, Rothko & Heiko. Definitely need to think about a Part II for this post! Helio is one of my faves. I know a Rio and the name is very masculine yet unique. Laszlo is a long-time favorite of mine. I’d love to meet one.